Did you get a call that someone needs Missoula bail bonds, and don’t know where to run for help or what to do next? Contact CMMBI and lock in the lowest rates for Missoula bail, any time of the day or night. We are open to serve you and your family in your time of need 365 days per year, even holidays. We are a profession bail bonds company in Missoula Montana (Missoula County), and can write any bail bond, big or small, to help effect the immediate release of your friend or family member at a moments notice. We understand that at this moment, things may look bleak. But, it’s extremely important that we get the defendant out of Missoula County Detention so they can get their life back on track and begin fighting the legal case against them. A professional bondsman is available to help you any time of the day or night. We know that bad things can happen to good people in Missoula. Our bail bondsman near you is available to write an emergency bail 24/7! Our licensed Missoula bail bondsmen have put together the following information to better help you understand the Missoula County Detention Facility bail bonds process in Missoula County. We’ve listed the jail, courthouse and sheriff’s department so that you can contact them if you need to. 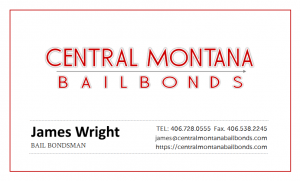 We do suggest you contact our bondsman on call, James Wright (406) 728-0555. The court administers criminal probable cause reviews, initial appearances on felony charges, misdemeanor arraignments, preliminary hearings and trials for misdemeanor and traffic cases. The court’s civil jurisdiction includes amounts up to $12,000.00 (not including attorney�s fees). If you’re asking yourself; bail bondsmen near me? CMBBI has a Missoula bail bondsman ready to help you 24 hours per day.